Once you have finished exploring the Japanese capital’s endless attractions, there’s lots more to see and do just a short train ride away. With exclusive access to some of the best sights in Tokyo and beyond, Tobu Railway offers travellers a smooth and efficient journey into the heart and history of Japan’s mesmerising capital city and surrounding areas. Its trains deliver curious visitors to the Asakusa area of Tokyo, where old and new intersect, the charming old town atmosphere of Kawagoe, the stunning city of Nikko, steeped in history and tradition, and the onsens and abundant natural scenery of Kinugawa. Here, the perfect four-day itinerary for riding the rails with Tobu Railway. Toshugu Shrine is Japan’s most lavishly decorated. Jump on the train and head to Kawagoe, an easy 30-minute ride from Ikebukuro Station on the Tobu Tojo line. Reminiscent of an old town from the Edo Period (1603-1867), when Japan was ruled over by the mighty Tokugawa Shogunate, the last feudal Japanese military government (the head of the government was known as the shogun), its main street is lined with kurazukuri, traditional clay-walled warehouse-style buildings. Known affectionately as ‘Little Edo’, visitors alighting Tobu Tojo line can spend the day strolling the compact city centre visiting museums, temples and shrines; don’t leave before seeing the charming Kashiya Yokocho or Penny Candy Lane, which is lined with shops selling rainbow-hued traditional lollies and sweets that make the perfect souvenir to take home. Back in Tokyo, Asakusa is hugely popular with visitors and has the feel of an old town, with its historic buildings, temples and shops, many of which have been run by the same families for over 100 years. Once out of the railway station, you can’t miss the enormous red-painted Kaminari-Mon Gate; walk through it and along bustling Nakamise-dori Street, with its shops selling bright children’s toys and games and traditional sweets and treats. 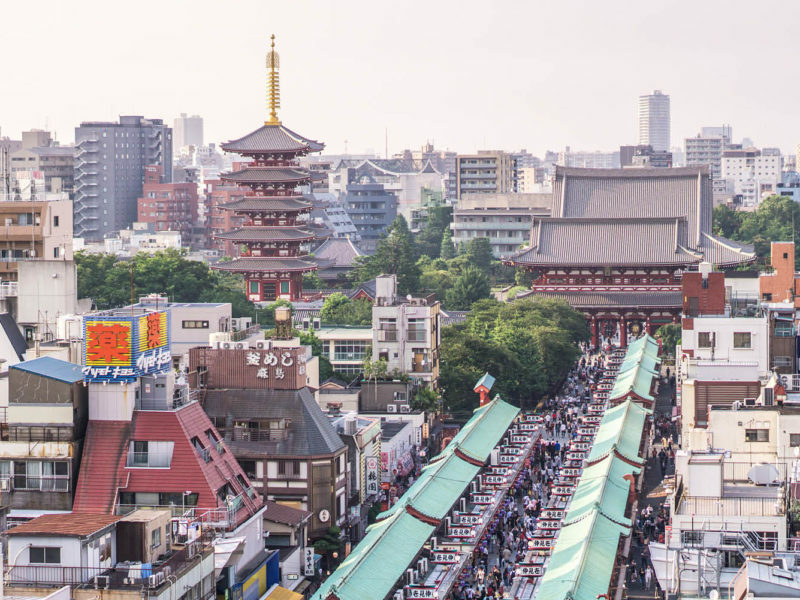 Eventually you’ll reach the imposing Sensoji Temple, originally built in 1649 (it was rebuilt in 1958), where locals stand silent in a fragrant fog of incense smoke to pray in front of the statue of Boddhisattva. Scale models on show at the popular Tobu World Square. Tradition and history give way to the new and modern at Tokyo Skytree Town, a shopping and entertainment complex dominated by the 634-metre-high Skytree. There are observation decks at 350 and 450 metres; on a clear day you can see the snow-capped peak of Mount Fuji standing proud in the distance, while at night the entire city of Tokyo is illuminated in bright, colourful lights. Once down from the Skytree’s lofty heights, spend some time in Tokyo Solamachi, with its 300 shops and restaurants, an aquarium, planetarium and museum. Tobu Railway’s Taiju steam train. Head out of Tokyo on the Tobu Railway line for the comfortable two-hour train ride north from the heart of Tokyo to Nikko. Sitting at the entrance to Nikko National Park, the city is blessed with stunning mountain scenery and has been a centre for Shinto and Buddhist worship for many centuries. Visitors and locals flock here to see the UNESCO World Heritage-listed Tosho-gu Shrine, Japan’s most lavishly decorated shrine. Dating back to the early 1600s, the sprawling shrine complex is the mausoleum of Tokugawa Ieyasu, the founder of the Tokugawa shogunate. The shrines and temples of Nikko are reached by another compelling sight, Shinkyo Bridge, ranked as one of the three finest bridges in the country. Built in 1636, visitors can now walk across the bridge after extensive restoration and renovation works. Spend the evening at the Nikko Kanaya Hotel, a seamless blend of western and Japanese traditions and architecture. The city will also boast the luxury hot springs resort Nikko Fufu in late 2019, and the Ritz-Carlton, Nikko in 2020. The tranquil beauty of Lake Chuzenji. Beyond its sprawling shrine complex, Nikko has much to offer nature lovers. The three sacred peaks of Mt. Nantai, Mt. Nyoho, and Mt. Taro, known collectively as Nikko Sanzan, that dominate the landscape of Nikko National Park have a long tradition of mountain worship; visitors can experience the area’s mystical side by trekking the mountains. Other natural wonders to seek out while visiting Nikko are the tranquil Lake Chuzenji and Kanmangafuchi Abyss, formed by the eruption of Mt. Nantai; you can experience it on a riverside walking trail, part of which is lined with some 70 stone statues of Jizo, a Bodhisattva who looks after the dead. From Nikko’s Shimoimaichi Station you can take the Taiju steam locomotive train to arrive in Kinugawa Onsen, the hugely popular hot spring resort town along the Kinugawa River. First head to Tobu World Square, a theme park made up of over a hundred scale models of some of the world’s most visited attractions, including UNESCO World Cultural and Heritage sites such as the Taj Mahal, the Vatican and the Pyramids at Giza. The scenes are made complete with 140,000 miniature people. Some of the 70 Jizo statues at Kanmangafuchi Abyss. Float down the Kinugawa River on a river boat ride complete with stories of the river’s history, and finish the day by checking into one of the traditional ryokans to soak in the hot mineral waters. Tobu Railway’s Nikko Pass includes round trip trains between Tokyo (Asakusa) and Nikko, free buses in Nikko, and 20 per cent off express fares. Also receive discounts at sightseeing facilities, souvenir shops, and restaurants. To find out more visit Tobu Railway or Tobu Japan Trip.